WHEN Munshi Prem Chand's first collection of short stories was published in 1907, it was promptly proscribed by the British, and later burnt. What better start could a socially conscious writer expect? Three years later Prem Chand struck back with Soz-e-Watan, another collection of short stories. He was once again summoned by the authorities, this time by the District Judge himself. Prem Chand was severly warned, and once again all the copies of his book were assigned to the flames. The authorities did not realise that the more they tried to silence him, the more he was getting drawn into the Freedom Struggle. Among Prem Chand's early influences was M. K. Gandhi, but later on he was inspired more by socialism, although in an interview before his death, he categorically denied that he was a communist. Every author is a product of his times, and usually there are more than one influences upon his work, and thus it is not surprising that Prem Chand's work reftected the struggle between Marxism, Gandhism, and Capitalism. Born in Lambati, Pandepur, Banaras, Prem Chand's real name was Dhanpat Rai. He got interested in literature after he made friends with Munshi Dayanarayan Nigam, the Editor or the Urdu magazine Zamana. Prem Chand had his first acceptance in 1904, writing under the pseudomymn, Nawabrai. 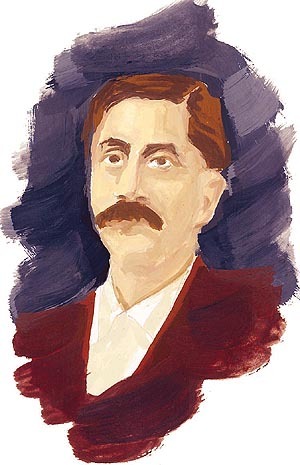 At a time when Hindi literature was rather overshadowed by its cousin, Urdu literature, Premchand lent respectability to the former by his outstanding work. Writing initially in Urdu, Prem Chand switched over to Hindi and wrote nearly 300 short stories and novels, the most acclaimed of them being: Sevasadan, Rangmanch, Godan, Gaban, and Nirmala.In Nirmala (1925) he vividly portrayed the evils of the dowry system. Godan (1936), was published in the year of his death is a moving portrayal of a poor peasant. Mukti Marg is the struggle between a landlord and a poor shepherd. A gifted writer that he was, he could vividly describe the plight of the poor even in a short story of a few pages like Kafan. Dogged by poverty all his life, he did try his luck in Bombay to become a script writer, but was soon disillusioned with the workings of the film industry. 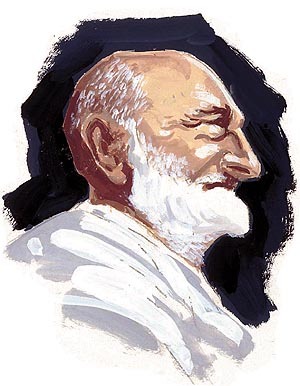 IF ever there was a stereotype Pathan of popular fiction, it was Khan Abdul Ghaffar Khan, popularly called Badshah Khan or Frontier Gandhi. Possessing a majestic visage, and standing at 6'3", he literally towered above all Pathan leaders of his time. But unlike the rustic and naive Pathans of fiction, Badshah Khan was a very polished and educated gentleman. Although he was a devout Muslim, he was no religious bigot. He used to tell his admirers, "My religion is truth, love and service to God and humanity. Every religion that has come into the world has brought the message of love and brotherhood. Those who are indifferent to the welfare of their fellowmen, whose hearts are empty of love, they do not know the meaning of religion." Badshah Khan belonged to a highly respectable family of Pathan chiefs of Utmanzai in Hastnagar in the NW Frontier Province of British India. In his autobiography My Life and Struggle he says that there is no record of the exact date or year of his birth. Badshah Khan got his early education in a mosque, but he soon realised that " the Mullahs were not aware of the true meaning of religion and very often they insisted that children should not ask any questions but should merely devote themselves to learning by rote and recitation." For his primary education Badshah Khan went to Municipal Board High School, Peshawar, and for higher education to Edwards Memorial Mission High School. But before he could complete matriculation he joined the army, and was attached to a regiment called 'The Guides'. 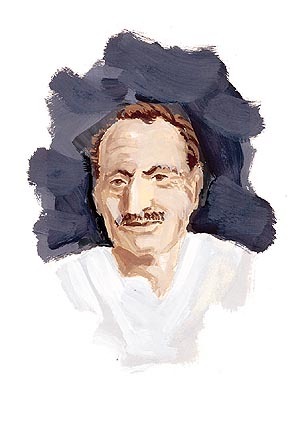 Being a Pathan, he took to army life like a duck takes to water, but one day, when he saw a Pathan being humiliated by a British officer, Badshah Khan was so upset that he left the army, and resumed his education. Sometime later Badshah Khan was all set to go to England for higher studies, but when he saw his mother cry, he gave up the idea and decided to devote his life to the service of his people. He actually plunged into active politics in 1919 by opposing the infamous Rowlatt Act. He was arrested and later released. As he got more and more involved in the freedom movement, he came into contact with the Congress, and attended the Nagpur session in 1920. He also played an active part in the Khilafat movement, and as a result, he was arrested in 1921 under the Frontier Crimes Regulations for spreading nationalistic ideas among the Pathans. He was kept in solitary confinement, with his hands and feet tied. After his release in 1924 he came to be known as Fakhr-e-Afghan. Since he believed that ignorance was the main cause of the backward nature of his province, he started a newspaper in Pashtu called Pakhtun, and in Afghanistan another one called Jagh Pakhtun. In 1929, he started the Khudai Khidmatgar Movement. And when Gandhi started the Civil Disobedience Movement in 1930, Badshah Khan joined it with full enthusiasm. In 1931 the Congress offered him the presidency of the party, but he refused saying, "I am a simple soldier and Khudai Khidmatgar, and I only want to serve." But he remained a member of the Congress Working Committee for a long time, resigning only in 1939 because of his differences with the Party's War Policy. He rejoined the Congress Party when the War Policy was revised. Then came freedom, and with it the man-made disaster called Partition. The British did not want the North West Frontier Province to be a separate unit or to be a part of independent India. Although a clear election victory had been achieved by Badshah Khan and his Khudai Kidhmatgars, a referendum was ordered. This was opposed and rejected by Badshah Khan, and he asked his people to boycott it. As a result the Muslim League had its way and the NW FP was annexed to Pakistan. For Badshah Khan, it was the greatest betrayal of all. This really broke his heart, but he did not give up the fight for the common man in the newly formed Pakistan with his Khudai Khidmatgars. Unfortunately democracy was always shaky in Pakistan, and he had to battle it out not only with the generals but also with democratically elected leaders, in the end making himself a liability. He was imprisoned a number of times for his liberal views, and in the end he died a heart broken man. AS the force behind India's Integrated Guided Missile Development Programme, he gave India. Prithvi, Agni, Trishul, Akash, and Nag, and Arjun. He indigenously designed an aircraft engine and a state-of -the -art electronic warfare system. But not the man to rest on his laurels, he has vowed to make India self-reliant in military technology by the year 2005, because he believes: 'Strength respects strength, and technology honours technology'. And yet when he heard that he was honoured with a Bharat Ratna, the highest honour of the country, he remembered first of all his teachers and the team of scientists with whom he had worked at the Vikram Sarabhai Space research Centre and DRDO. "I couldn't have done it by myself," he admits, "Behind me there were thousands of scientists. I only shaped the programmes." For a man destined to accomplish such great feats, Dr. Abul Kalam has had very humble beginnings. One of the six children of a very poor family in the temple town of Rameshwaram in Tamil Nadu , he was lucky enough to have good friends and teachers like Chidambara Subramaniam, who were instrumental in sending him to Sheward High School, Ramananthapuram. and later for graduation in Physics to St Joseph College, Trichinapally. As he was an outstanding student, it was not difficult for him to get into the prestigious Madras Institute of Technology. No doubt it was his sister who pawned her jewellery to pay for the entrance fee. But the sacrifice of his loving sister did not go in vain, for today, her brother is the father of India's missile programme and a key functionary associated with the country's nuclear weapons programme, as well as principal scientific advisor to the government of India. Since 1993 he is the Chairman of Technology Information Forecasting and Assessment Council. After his education Dr Kalam was offered a post at Defence Research and Development, Organisation (DRDO) in 1958. A self-made man, the only training he ever had abroad was a four-month stint at Wallops Island Rocketry Centre under the Indo-US space cooperation programme in the early 1960s. Five years later he went to the Indian Space Research Organisation where he became the Project Director of SLV-3 and Rohini which took off in 1980. With such successes behind him he soon realised that they could be used to enhance India's nuclear weapons programme. While Dr Kalam is humble enough to credit his successes to his teachers and colleagues, he is bold enough accept failures. When when the SLV3 experimental launch failed in 1978, he claimed all responsibility. A simple peace-loving man, Dr Kalam doesn't mince words when he says that only the strong can talk about peace; the weak have to accept what is offered to them. And since wars in future will be short and intense; 'stealth and lethality' will dictate the strategy. We have to prepare ourselves for every eventuality, and Dr. Kalam and his team of 7,000 dedicated researches and scientists at 50 laboratories of DRDO are doing their best to make India a force to reckon with. And for this the first step would be to avoid assistance from others as much as possible. "A self-reliant nation," he stresses, "will have the capability for design and development of crucial systems. Self-reliance does not mean isolation. It means keeping our vital interests." But he is not a typical absentminded professor, busy in his laboratory with his experiments. 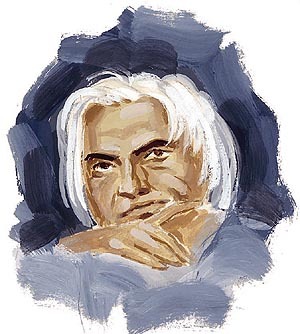 Far from it, Dr Kalam is a warmhearted man who plays the veena, and writes poems in Tamil. His favourite poet is Subramanya Bharati. Although Dr Kalam is a devout Muslim, he is a vegetarian, teetotaller, and bachelor who reads the Bhagwadgita, thus prompting his friends to nickname him, 'Kalam Iyer'. Or did I provide weapons of destruction? NANDALAL BOSE was one of the greatest Indian artists of the 20th century, an acclaimed genius, but this great man found it extrremely diffictult to clear his First Arts examinations. Since academics was not his strong point, he was shunted from Central Collegiate School to General Assembly's Institution to Metropolitan College, and finally to Presidency College. And when nothing worked, he was finally sent to Government School of Art in 1905, where Abindranath Tagore, one of the giants of the Indian Renaissance. There he first studied under the tutelage of Iswari Prasad and Harinarayan Bose, and then under the great master himself. Nandalal Bose had finally seened to have found his vocation. Nandalal Bose's father, Purna Chandra Bose, was a Dewan and architect -engineer in the court of the Maharaja of Darbhanga. But Nandalal probably inherited art from his mother, Kshetramoni Devi, who was well versed in various crafts like embroidery and cross stitching. With paintings like Sati,and Satir Dehatyag, which were exhibited in the maiden exhibition of the Indian Society of Oriental Art, in Calcutta, 1908, Nandalal Bose made an impact in art circles from his art school days itself. The prize money of Rs. 500 was spent on visiting various archeological sites around India. It was not long before Nandalal met Rabindranath Tagore at the latter's residence, Jorasanko. The budding artist couldn't have hoped for a better launchpad for his career than the Jorasanko because there he came in contact with luminaries like: Sir J. C. Bose, Count Okakura, Girish Chandra Gosh, Sir John Woodroffe, Lord Carmichael, Lord Ronaldshay, and so on. He also met the great art critic, Ananda Coomaraswamy, and helped the latter catalogue Rabindranath Tagore's paintings and sculptures. He later illustrated the book Myths and Legends of the Hindus and the Buddhists, co-authored by Coomaraswamy and Sister Nivedita. Impressed with the young artist's work, Gurudev Tagore asked him to illustrate Chayanika. Later the poet wrote a poem after being inspired by Nandalal's painting Diksha. This was probably the greatest compliment he ever received for his work. The discovery of the Ajanta caves had created ripples in the art world, but since the paintigs were frescoes on the walls of dark caves, it was impossible to have them reproduced in print. In those days the the art of colour photography had not advanced to the high degree of sophistication it has today, so the alternative was to send a team of excellent artists to copy the frescoes. And hence when Nandalal Bose was chosen to accompany Lady Haringham and her team to Ajanta, it came as no surprise to his admirers .The technique used by Ajanta artists had a great impact on his work. It was about this time that he came in touch with Arai Kampo, a Japanese artist of the Okakura school. From him he learnt the Japanese style of using the brush and ink technique. Later he was assigned the job of copying the frescoes of the Bagh caves. These two experiences enriched his work and Nandalal's life-long love of murals. The going for him got rough with the death of his father, but luckily for him Abindranath Tagore came to his rescue by offering him a teaching job at Indian Society of Oriental Art. When Rabindranath Tagore started Santiniketan, he offered Nandalal Bose a job. 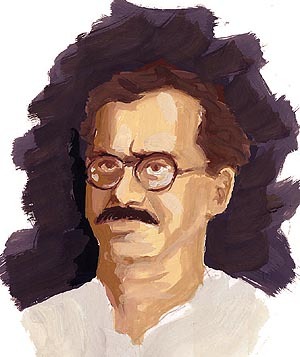 Nandalals initial aversion to academics notwithstanding, he wrote two acclaimed books on art: Silpakatha (1944) and Silpacharcha (1956). WHEN Lord Curzon announced the partition of Bengal, he would not have known then that his dicision would give birth to so many revolutionaries such as Khudiram Bose, Aurobindo Ghose, and Rash Behari Bose. GIven the circumstances, it was natural for J. B. Kripalani, a energetic young man from Sind, to find himself i the grip of patriotic spirit. Being a trenchant critic of the oppressive policies of the British, he started an agitation in Wilson College, forcing theauthorities to transfer him to D. J. Sind College, Karachi. There, too. he got himself in trouble because of his political activities.When the principal of the college remarked that Indians were liars, Kripalani organised a strike. He nevertheless managed to get through his education despite his activities, taking a master's degree in history and economics from Ferguson College Poona. From 1912 to 1917 he worked as Professor of English and History at Muzaffarpur College, Bihar. It was while working for Bhumidar College Muzafarpur in Bihar, that he came under the influence of Gandhi, and gave up his job in 1917. He served as secretary to Madan Mohan Malaviya, and it was he who got him back to academic life by appointing him as professor at Banaras Hindu University. But Kripalani left the university in 1920 to join the Non-cooperation Movement. Taking a cue from Gandhi, he set up an Asharam at Meerut in order to uplift the villagers of Uttar Pradesh, Madhya Pradesh, and Delhi. He served as Principal of Gujarat Vidyapeeth until 1927. He was so popular that his students bevan to call him 'Acharya' Kripalani. He was secretary of Congress for over a decade. From the late twenties he devoted himself wholly to Congress work. He steadily built up his position in the organisation, and from 1934 to 1945, he served as the General Secretary. He was arrested in 1942 for his part in the Quit India Movement, and released in 1945. The following year he ws elected President of the Indian National Congress. When at the age of 50 he married a girl named, Sucheta, . Gandhi was upset. He said to the girl, "By marrying Kripalani, you will be cutting off my right hand." Not to be outdone, Sucheta replied, "Why cannot you think that you will be gaining an additional hand for your work. "Nehru was the best man at the marriage that took place at Anand Bhavan.By sharing the responsibilities of her husband, she proved Gandhi's fears wrong. After Independence, he gradually drifted away fron Congress, and finally resigned from the Congress Party in 1951. Kripalani wanted the organisational wing and legislature wing of the Congress Party to be clearly defined so that the Government did not become autocratic. When he saw this was not happening he resigned the Presidentship. Kripalani beleived that opposition was essential for a vibrant democracy. Since there was hardly any opposition to the gigantic stature of Nehru, he founded Kisan Mazdoor Praja Party as an alternative to the ruling Congress. Unfortunately this move was not very effective at the time, and Kripalani withdrew to teaching and social service. But he did have the satisfaction of seeing a viable opposition appear in 1977 with the formation of Janata Party. He backed Morarji Desai for PM. Unfortunately the Janata Party did not last long, and this was a blow to his hopes. Acharya Kripalani was a great social thinker and writer who has to his credit a numer of books on Gandhian philosophy: The Gandhian way, The Ganchian Critique, The Indian National Congress, and The Politics of Charkha. This untiring fighter of freedom died on March 19, 1982, of respiratory and cardiac arrest at Ahmedabad.